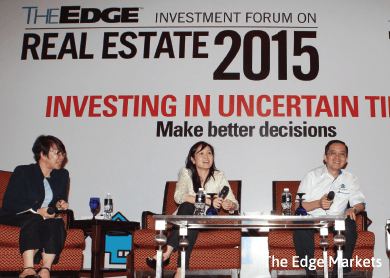 KUALA LUMPUR: More than 750 readers of The Edge weekly attended The Edge Investment Forum on Real Estate 2015 at a hotel in Petaling Jaya on Saturday. The forum, in its ninth year, was themed “Investing in Uncertain Times: Make Better Decisions”. 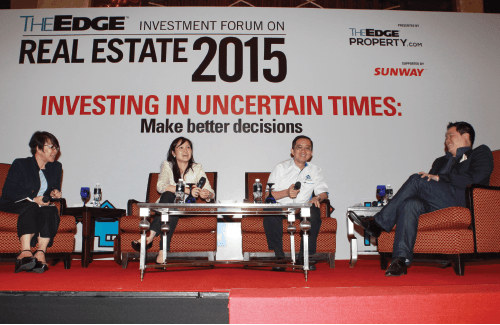 It was organised by The Edge weekly, presented by theedgeproperty.com with support from Sunway Bhd. This year, as usual, it featured experts in the property industry to speak about various topics that impact the property market. He also briefly introduced the group’s new property information portal,theedgeproperty.com, which will offer property news, information and analytic tools to help investors and homebuyers make better decisions with regard to property purchases or investments. He also believes that property market will continue to be resilient, given Malaysia’s positive gross domestic product, low unemployment rate, progression of the economic transformation programme projects, and the multiplier effect from large infrastructure projects. The next session was presented by Ho Chin Soon Research Sdn Bhd chairman Ho Chin Soon, and its CEO, Ishmael Ho on the topic of “Property Hot Spots — Heating Up or Cooling Down?” They spoke on value creation in property investments thanks to good infrastructure with focus on Penang, Iskandar Malaysia in Johor and Greater Kuala Lumpur. The third speaker was The Edge Media Group executive chairman Datuk Tong Kooi Ong who presented “Democratising Property Investment”. “There is always an opportunity to make money in the property market, but for now you need to be more ‘democratising’. It means you have to be able to access information and analyse it to find opportunity out there,” said Tong, who also introduced theedgeproperty.com and its features during the session. A panel discussion themed “Post-GST — The Real Impact on Buyers” featured Sunway managing director of property development division for Malaysia and Singapore, Sarena Cheah; Real Estate and Housing Developers’ Association Malaysia deputy president Datuk Soam Heng Choon; and Reapfield Academy Group CEO and president Dr Gerard Kho. The session’s moderator was The Edge Communications Sdn Bhd managing director Au Foong Yee. Several topics were discussed during the panel discussion, including the impact of the goods and services tax on market players and homebuyers; the relationship between household debts and the property prices; the affordable housing issue; and the housing supply and demand issue, among others. In addition to the talks, the attendees also visited Sunway’s booths, which displayed new property projects and also theedgeproperty.com’s introduction booth, where participants checked out the features of the portal. One of the participants, James, who is a listed company director, said that he was impressed with the new property portal. “This is something new for Malaysia. I would say this is a good breakthrough that could benefit not only readers but also people in the industry,” he shared. Another attendee, Pauline said that this was her eighth time attending the forum. “As usual, this is an enlightening event. I came here to know more about the market outlook. All of the speakers have very good insight into the market,” she said. Snippets and videos of the event can be read and viewed on theedgeproperty.com. The complete report of The Edge Investment Forum on Real Estate 2015 will be available in the May 4 issue of City & Country, the property pullout of The Edge Malaysia. This article first appeared in The Edge Financial Daily, on April 27, 2015.